1996 Dodge Viper GTS - His best ET and MPH to date is 11.62 @ 120.61 on regular Michelin Pilot SX street tires. He has added a K&N drop-in air filters, Removed rain baffle from air box, smooth tube intake hoses, Edelbrock headers, Borla cat back exhaust. STD Max Horsepower, 464.3 RWHP. 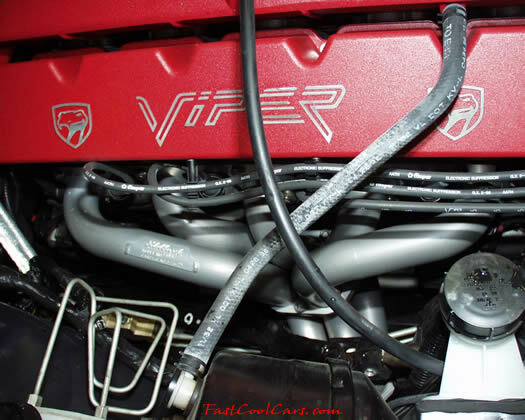 Lightweight, yet durable and easy to cool, aluminum lies at the heart of Viper's remarkable V10 engine. The block is cast aluminum with cylinder liners of cast iron. Forged steel is used for connecting rods and crankshaft, and stainless steel for exhaust manifolds. Magnesium is used for the rocker covers, 1999 Fan Upgrade.